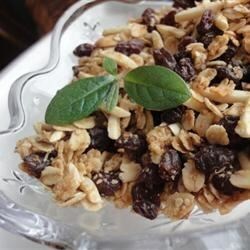 "This granola is good and crunchy with lots of sweet flavor, thanks to the pure maple syrup and dark brown sugar. It uses a lot less oil than some granola recipes. Can be made 1 week ahead." Preheat the oven to 250 degrees F (120 degrees C). Lightly grease a cookie sheet with sides, or a large cake pan with cooking spray. In a large bowl, toss together the oats, almonds, wheat germ, coconut, and sunflower seeds. In a separate bowl, whisk together the maple syrup, brown sugar, oil, water and salt. Pour the liquid over the oat and nut mixture, and stir until evenly coated. Spread out on the prepared cookie sheet. If you want some chunky bits, squeeze some small handfuls into little clumps. Bake for 1 hour and 15 minutes in the preheated oven, stirring occasionally until evenly toasted. Mix in raisins. Cool, and store in an airtight container at room temperature.